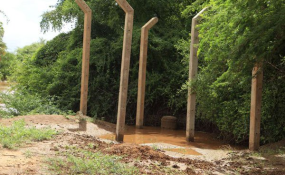 Five of the six concrete polls at the site of the security wall construction at Mandera border point one, as pictured on May 10, 2016. Kenya has intensified security patrols at the border points with Somalia to halt intrusion by al-Shabab militants responsible for a spate of attacks targeting civilians and government installations. Mohamed Birik, North Eastern regional commissioner, said that enhanced security measures including the ongoing construction of a border wall seek to prevent Somalia-based terrorist group from staging attacks inside the Kenyan soil. "We have secured our roads and international borders so that we give al-Shabab no space to operate and have no freedom to do their evil work in Kenya," Mr Birik said. He said the government has also boasted the security of major supply roads where civilians lost their lives following planting of improvised explosive devices by militants. Al-Shabab fighters have in the past killed civilians in Kenya before slipping back to Somalia, a phenomenon blamed on the porous and extensive border. In an effort to tame attacks in Kenya, the government started constructing a security fence which is manned by Kenya Defense Forces. Kenya hopes the building of the 700 km wall on the Kenya-Somalia border from Mandera in northeast Kenya to Kiunga in the coastal area will keep out the al-Shabab elements from infiltrating the county from Somalia. Mr Birik said security personnel have intensified the hunt for suspected al-Shabab militants and their sympathizers hiding in the expansive northeastern part of the country. He revealed that Kenya police reservists have been recruited in all villages along the border with Somalia to supplement efforts by other security agencies engaged in the fight against terrorism. According to Mr Birik, the reservists who are drawn from retired security officers have been deployed to hotspots. "They will help the police in securing their respective villages while also protecting important government installations and water points," said Mr Birik.